More than 830 000 Rohingya refugees are sheltering in Bangladesh, having escaped violence and persecution in Myanmar. This includes more than 618 000 people, the vast majority women and children, who have fled since violence erupted on 25 August. The momentum and scale of arrivals make this the world’s fastest growing refugee crisis. 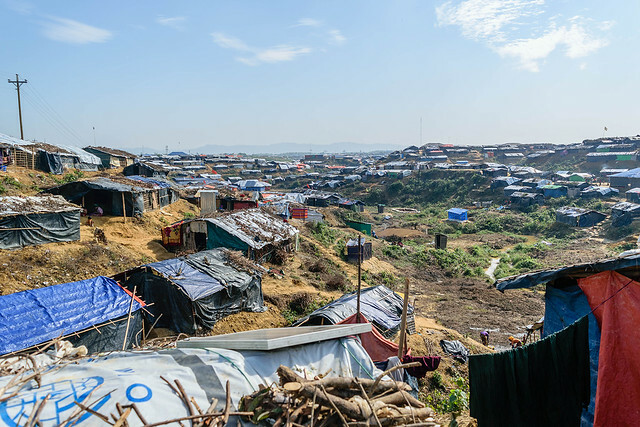 The incoming refugees are housed or have sought shelter in Cox’s Bazar and its upazilas, where extensive pressure is being placed on resources. One significant resource is increasingly limited cooking fuel. Wood fuel collected from protected forest reserves is the main source of cooking fuel for refugees. The speed of the influx of arrivals is contributing to the lack of cooking fuel in markets and its high prices, now reaching more than 60 percent of refugee households’ weekly expenditure. To afford fuel, people are resorting to selling food and assets. More and more food, firewood and other commodities are being imported from neighbouring districts, as local people are unable to meet the demands of the burgeoning market. High prices of goods and transportation are increasing the negative impacts on the local population. Mobilizing resources to support one of the world’s poorest and most densely populated countries has proved challenging. The Government of Bangladesh is responding to the crisis in partnership with national and international humanitarian and development agencies. Short- and medium-term solutions are needed to increase support to host communities and families supporting refugees, and improve the wider food and agriculture environment of impacted areas outside camps. The Food and Agriculture Organization of the United Nations (FAO), with government partners, civil society and other United Nations agencies, is working to meet early response needs and contribute to longer-term solutions to the region’s endemic poverty. By building on successful work with partners through the Safe Access to Fuel and Energy (SAFE) initiative, FAO is addressing energy needs during this crisis to build resilience. The coordinated response is guided by the Food Security cluster, co-led by FAO and the World Food Programme (WFP). The Inter-Sectoral Coordination Group, headed by the International Organization for Migration (IOM), coordinates ongoing humanitarian assistance. A joint project with WFP and IOM that contributes to the Humanitarian Response Plan is planned for December 2017–2020. The objectives are to address the increasing lack of access to cooking fuel for Rohingya refugees in Kutupalong refugee camp, curtail environmental degradation and rehabilitate the resource base and economic livelihoods of the host population, while securing a safe and healthy environment in camp areas. The FAO Refugee Crisis Response Plan is estimated at USD 22.6 million to assist refugees and host communities. The plan complements the objectives of the food security, shelter and site management sectors, with timing reflecting that of the Rohingya Refugee Crisis Humanitarian Response Plan. Phase 1 activities are taking place until February 2018 and Phase 2 activities are planned from March 2018.
undertake cash-for-work activities to address environmental degradation, land stabilization and erosion control in areas where water sources, population security and agricultural lands are threatened. support agriculturalist groups to better participate in market activity.